Has worked with Franck since 2001. Olivier got the excavation virus during his vacation in the region of Dijon at the age of 14. He then spent most of his summer on archeological sites in France, Europe, Middle East or Canada. He graduated in archeology at the Sorbonne and in Biochemistry at the National College of Chemistry (France) then completed his training with a Master of Science in Conservation of archaeological objects, at the Sorbonne (France). Growing up by the sea, he couldn’t resist her call therefore in May 1995 he became a professional diver specializing in underwater archeology. 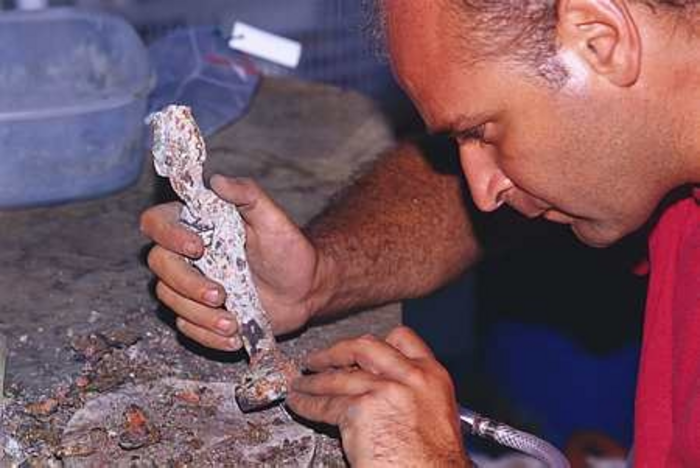 This made him one of the few specialists in the conservation of underwater heritage and allowed him to work for the closed circle of underwater archeology. He has worked for the DRASSM among others on more than twenty underwater archaeological sites, before returning to travel and work with Franck in Egypt. In 2002 he founded his private conservation Studio AMC Art Metal Conservation GmbH, and maintains a part time position as conservator at the Antiken museum in Basel. He is working in metal conservation, indoor and outdoor but mainly specializing in marine artifacts. His research interests include new ways of treatment for underwater object. "It's a luxury to do what one love not as a hobby but professionally. Dream and passion can transform work into pleasure.